The fishing industry will get a larger share of domestic catch after Brexit once the UK “decides access” to its own waters, Michael Gove has insisted. The environment secretary said the UK would be in the “driving seat” in quota negotiations once the UK leaves the EU’s Common Fisheries Policy but would not commit to a specific figure. The Scottish government said it had not been properly consulted about the UK’s proposals for fishing after Brexit, unveiled on Wednesday, and had “significant concerns” about them. Ministers have urged the industry to keep their “eyes on the prize” of getting full control and have now published a White Paper setting out their vision for how they UK will do this as an “independent coastal state”. Mr Gove told the BBC that from 2021 the UK would control fishing access to a 200 nautical mile “exclusive economic zone” around its coastline. While he would not be drawn on what share of catch the UK could keep in this area after Brexit, he said there was no reason the UK should be in a “weaker position” than Norway or Iceland – which retains 80% and 95% respectively of fish caught in their territorial waters. “Like other independent coastal states, we can decide who has access to our waters and we can ensure that a greater proportion of the fish in our waters is caught by British vessels, landed in British ports and processed by British producers,” he told BBC Radio 4’s Today. While accepting there would still be annual negotiations over catch quotas in British waters, he said “it will be a negotiation where we hold the cards and we are in the driving seat”. Mr Gove said market access for fish exports – which has yet to be negotiated between the UK and the EU – would be treated separately from the question of access to each other’s waters. The EU has previously suggested the two issues should be tied together. During a Commons debate on the plans, Conservative MP John Redwood said Brexit could be a fillip for the UK’s 10,000 or so fish and chip shops. “Isn’t it the case that we have a huge opportunity here to make sure that much more of the fish is landed by our boats in order to make sure that our traditional fish and chips is once again fish from our fishing grounds, properly looked after by a national policy?” he said. But Labour warned of a gap between what Mr Gove hoped for and what he could deliver. “This white paper is full of optimism for the negotiations but the only deal so far agreed on fishing is we’ll keep EU fishing policies during the transition period – and we’re not holding our breath that this will all go according to plan,” said shadow environment secretary Sue Hayman. Ministers have said they will publish an annual statement of fish stocks and work with the Scottish, Welsh and Northern Irish governments, to whom fishing policy is devolved, to help any struggling stocks to recover as well as helping them to “maximise their power to manage their fisheries”. But the SNP’s foreign affairs spokesman Stephen Gethins said there was no mention in the report of the European Maritime and Fisheries Fund, which he said had been vital in helping coastal communities in Scotland and across the UK to diversify. “There are a number of areas where we think there have been omissions,” he told BBC News. 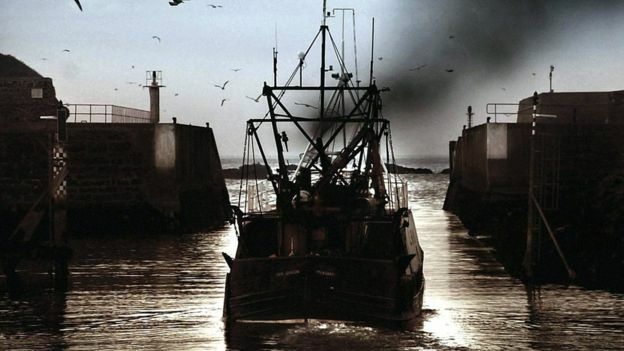 Scottish Fishermen’s Federation chief executive Bertie Armstrong – who has suggested the UK could emulate Norway and Iceland – urged ministers to show “real backbone” in the negotiations ahead. “At last we have a positive statement of taking back control of our waters and righting some of the wrongs that have been running for forty years,” he said. Fishing featured prominently in the 2016 EU referendum campaign, with Leave campaigners saying the current rules encouraged overfishing and mismanaged stocks – and it led to one of the campaign’s most memorable moments as Nigel Farage and Bob Geldof traded insults on boats during a protest on the Thames. UKIP’s fishing spokesman Mike Hookem warned the industry would see little change under Mr Gove’s plans.